Sometimes known as the Crusader, the NB-36 was intended to prove the feasibility of carrying a nuclear reactor in flight, towards an eventual goal of a nuclear-powered aircraft with unlimited endurance. 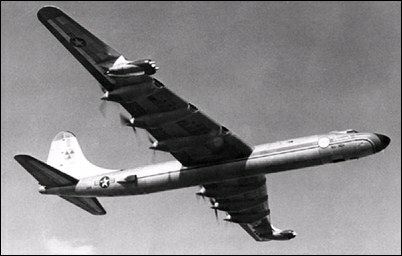 The NB-36H was built using components from a B-36 destroyed in a tornado with a new nose compartment heavily lined with lead and thick yellow tinted glass to protect the crew from radiation. The consequences of an NB-36H crash were so frightening that several support planes, including one filled with a team of paratroopers, followed the aircraft on every flight. Should the NB-36H crash or have to jettison its reactor, they would jump and secure the site and help with clean-up. A hotline to the president's office was set up in case of disaster. It was nearly used on one flight when a smoke marker went off in the reactor compartment. I would like to know if drawings of the WS-125 (B-72) are around? Would like to build an RC model of this. That is the plane that the they were testing the reactor for. Thanks for your help. There was only ONE, so whatever you saw at Mojave was NOT one of these. The reactor was removed from the NB-36H and it was buried under what is now the employee parking lot for what is now Lockheed Martin. Whether being buried in Fort Worth qualifies as "somewhere far away from civilization" or not, I'll leave for others to decide. :-) Best of luck to the one who is "writting an artical". I worked in Flt. Tes at GD during the late 50's. T freequently inventoried Bailment instruments on this aircraft. I knew all the Flt. Test engineers on this aircraft. The man who said he flew one of these one time -- didn't. I only know of 1 aircraft. Never heard of a 2nd. It would have been our inventory and I would have had to verify its existence and location and flying tatus. I do not know what became if the plane. The plain itself would not have been radioactive. They only loaded the reactor when it flew. My daddy worked on this project. He was a nuclear physicist, his name was Barry Spears. Cool plane. THERE IS ONE PARKED AT THE ENTRANCE TO MOJAVE INT. AIRPORT CA. I believe the major reason for the NB-36 was to verify that a nuclear reactor could maintain stability despite the flight vibration/shock environments. Conceivably, vibration could cause displacements in the position of the reactor control rods resulting in the reactor going super-critical. Ground tests, analyses, and simulation can only go so far in resolving this issue but only flight testing would put the matter to bed. I am sure the government was close to 100% sure no reactor incidents would occur but there is always some element of risk. Hullo: A friend who completed his dad's contract at Oak Ridge searched for the NB-36. he was told it was so radioactive, it was dismantled (perhaps by robotic devices), and buried in the ground somewhere around Oak Ridge. That is the usual thing...bury it and not know if there is an Aquifir nearby or under it. Anybody want to trade photos of this aircraft, I only one or two not good quality, can trade for what you have. I have loads of all kinds of aircraft photography. There were two NB-36s built. One was non-radioactive and, I think, scrapped in Ft Worth in 1958. The second, the nuclear test-bed, is parked somewhere far away from civilization...like a National Nuclear lab somewhere...does anybody know? i flew one of these....back in the day. Was the NB-36H rebuilt in Ft. Worth? Tornado damage suggests that. Or, was it done in Southern California? I worked at Convair from 1955-1959 on the NB-36H as an electronics tec. We also had a 3 mega watt reactor which we did many tests on various equipment used by Nasa. I started my days at Consolidated- Vultee with the B-36D and then went on to the C-T29B/C followed by the C-440 and later on the C-880/C-880M finishing my aircraft time with the C990/C990A. I retired from Convair after a long time with Atlas and AtlasII at both Harlingen TX.and Vandenberg AFB CA, Presently am doing research on writting an artical on all of Convair/Canadair a branch of G-D Turbo-Proped aircraft along with pictures and 1:144 scale models of same. I'm well into the whole line of Convair aircraft prior to WW2 and during same I presently have most of all the models produced and some I produced myself. I guess one could say I'm well into Aviation History. Maybe I might be hearing from you sometime. By the way the C-990 was leftout on the Convair Aircraft page 3 for 1960 thru 1962 period. � The five-man crew, which included a pilot, copilot, flight engineer and two nuclear engineers, were located in the forward section of the aircraft, while the atomic reactor was located in the rear section. � The crew were so isolated from the engines and the outside world because of the thick shielding that they could barely hear the very noisy engines and likened the experience to flying a submarine. � The engines of a normal B-36 were inspected in flight by the aft crew members. On the NB-36H this was done by a television camera system, as was observation of the reactor itself. � The reactor did not power the aircraft or any of its systems. It was only operated when the XB-36 was over a test range in New Mexico. In all the 'Crusader' only made 47 flights, all of them in daylight and beginning and ending at Carswell AFB, Texas.